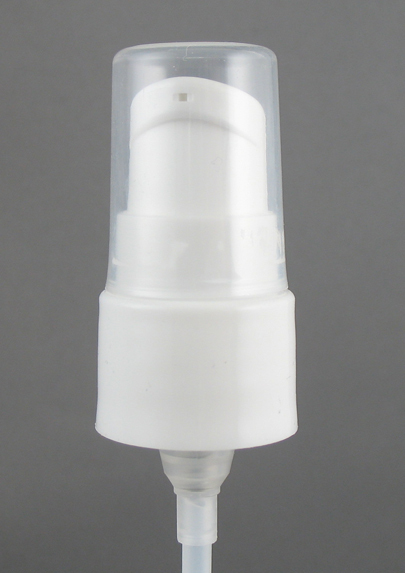 Cosmetic style treatment dispensing pumps offer the most controlled output for a precise dosage of your product. Common uses for these pumps include moisturizers, wrinkle creams, eye creams, essential oils and other fine cosmetic products â basically any product where small doses between 0.1 cc to 0.2 cc per stroke is needed. High quality cosmetics demand high quality packaging to protect the product and increase customer satisfaction by easily dispensing exactly what the customer wants every time they use your product. Because of this each component of these pumps has been designed to work smoothly and easily from the first to the last drop. Easy to prime and lower actuation force and the highest level of quality control and functionality is what sets the high quality dispensing pumps apart from inferior imported products. 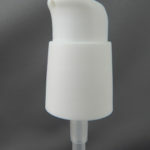 These Dewdrip treatment pumps are designed to work just as well on glass as they do on plastic and come in a large range of neck sizes to accommodate bottles as small as 1/2 oz and as large as 32 ounces. 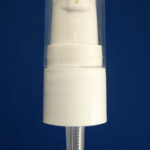 Since these pumps are designed for products for people on the go, a clear dust cap comes standard with every treatment dispensing pump to prevent the pump from leaking in a pocketbook or suitcase. 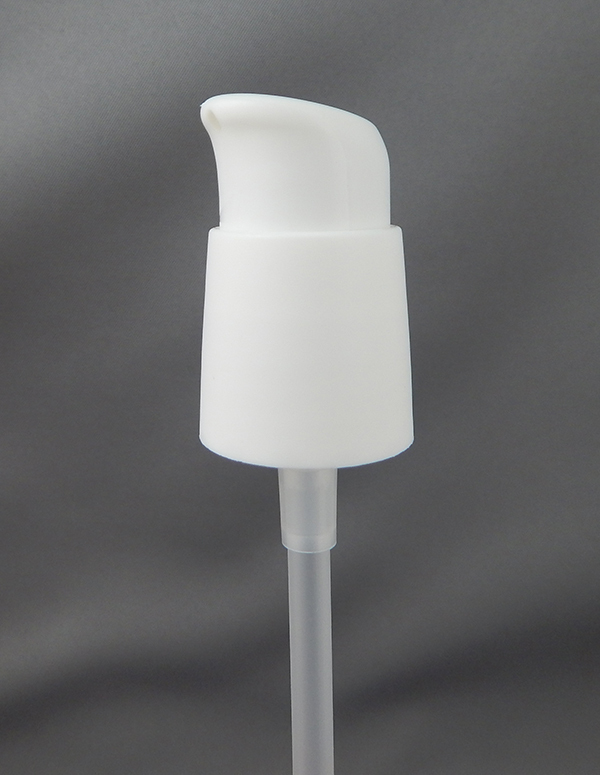 Since these pumps are mostly used for cosmetic products, many of our customers choose to go with custom colors for the pump rather than our standard white. Custom metal collars in gold, silver, or any other color are very popular as well. While we can offer four outputs 0.10 cc, 0.13 cc, 0.17 cc and 0.20 cc per stroke, the treatment pumps we keep in stock for immediate shipment are 0.20 cc. 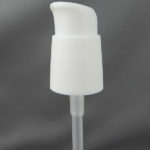 Our minimum order on pumps we stock is only 1 case. 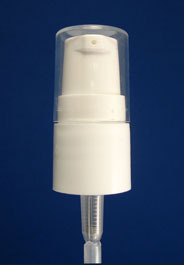 Need a dispensing pump with a lower output for fine cosmetics? 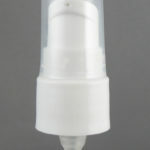 Check out our Dewdrip cosmetic style treatment pumps. Our Classic III series 3.5 cc and 4.0 cc high output dispensing pumps set the standard for the most cosmetically appealing high output pump on the market. Since they are made in our own facility here in the USA, we can make the smallest production runs and deliver them to you faster than anyone in the industry. 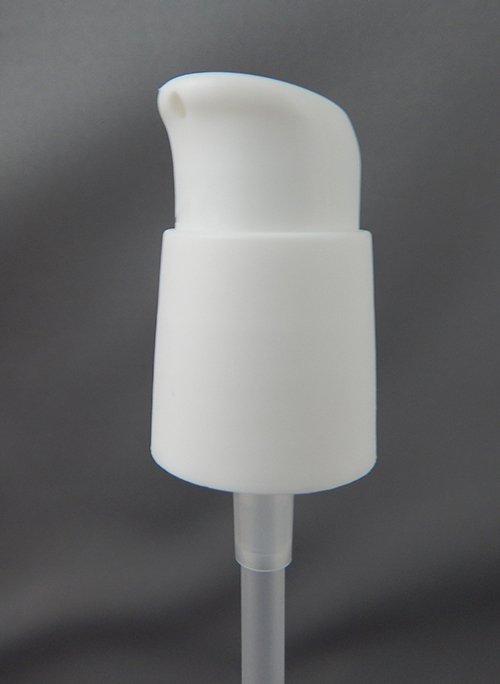 Our Ultra series 30 cc (1 oz) Ultra high output dispensing pumps are built tough, but have the lowest force to actuate of any other ultra high output dispensing pumps making them the #1 choice for both consumer and industrial packaging. Our facility here in the USA can make small custom runs on these pumps faster than anyone else in the industry.